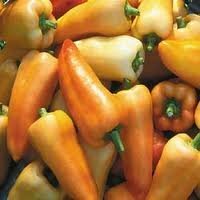 FEHER OZON PEPPER is a extremely productive Hungarian heirloom which many credit as the finest for paprika production. The pretty, bright orange, conical fruits measure 4"-5" x 3" at their tops. Exceptionally sweet and a little spicy. You will get approximately 12 pepper per plant, which grow about a foot high, so a good choice for container growing.